Out in support of last year’s excellent fifth album Haiku from Zero, Australian indie dance rock pioneers Cut Copy are set to play their first proper Nashville show in four years tonight, April 2 at Exit/In. Fusing DJ and electronic roots with the disco, dance punk, and synth rock boom of the early ’00s, Cut Copy emerged more than a decade and a half ago as a beloved fixture in the indie scene, and have continued to experiment with their sound, maintain a remix and instrumental passion, and grow as an astonishing live force, holding their own alongside peers such as Death From Above 1979 and LCD Soundsystem. Considering how infrequently they play Music City, this show feels like a must-see outing, and tickets are still available right here. Find out more about the show below! What started as a bedroom DJ project in 2001 for frontman Dan Whitford, and quickly blossomed into a full-fledged dance rock band, Australia’s Cut Copy (or Cut/Copy, as it’s commonly spelled) made their mark with cult classic 2004 debut LP Bright Like Neon Love and have remained a powerful musical fixture since. Rounded out by guitarist/synth player Tim Hoey, drummer Mitchell Scott, and bassist Ben Browning, all of whom effectively serve as multi-instrumentalists, the band arrived at a time when nostalgic synth and disco rock and new wave was merging with modern dance punk and electronica (now a pretty common mix of indie rock influences, but then a revolutionary sound), and with a bit of right place, right time, and a bit of pure musical greatness and originality, become a beloved new act. By sophomore effort In Ghost Colours, Cut Copy were touring the world with acts like Daft Punk, and following a similar trajectory to peers like Death From Above 1979 and Hot Chip, becoming darlings of the blogosphere and festival favorites, and finding their music licensed in a variety of spots. 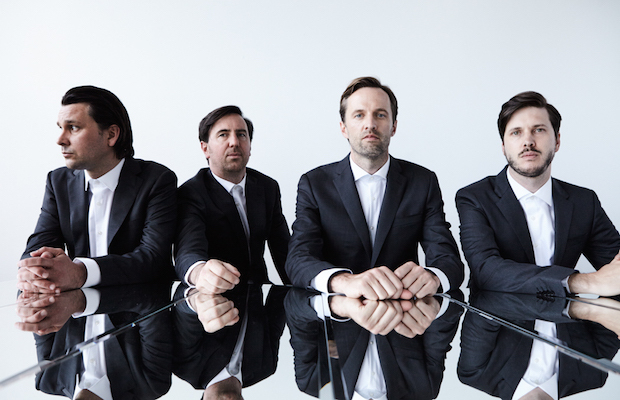 Though properly a band, Cut Copy have never abandoned their DJ and electronic roots, and have continued to release remix and instrumental efforts, as well as perform DJ sets, over the past decade and a half. After taking some time to indulge those remix roots, the band returned last year with a new proper studio effort, fifth full-length Haiku from Zero, tapping into some of their more nostalgic influences while managing to fit in with the contemporary, synthed-out indie rock landscape bands of their mid-’00s era helped influence. Long renowned for their impressive live show, Cut Copy’s Nashville appearances are few and far between, so you should never miss an opportunity to see them in action. Cut Copy will perform tonight, April 2 at Exit/In. The show is 18+, begins at 9 p.m.(doors at 8 p.m.), and tickets are available to purchase for $25.